This Patriotic Swooper is Competitively Priced! Flags for Outdoor Use are Stocked by the 100s by This Online Competitor! Purchase a Patriotic Swooper from This Trusted Source Today. Single printed side dyed-through for a mirror image on backside. Patriotic Swooper- "American Flag Pattern"
This patriotic swooper that is red white and blue includes an aluminum flag pole that is easily transportable and long lasting. In a competitive business market, these streamers help set establishments apart. This patriotic swooper is extremely seeable. These feather banners are made with a long lasting poly knit material. This star spangled patriotic swooper has an always seeable design. This blade flag kit flutters in the wind which creates curiosity from customers. 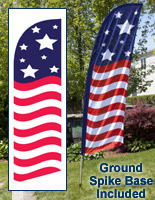 This patriotic swooper that includes a ground spike allows for durable outdoor installation. 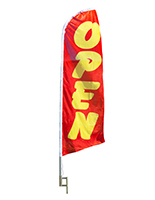 This flag is brightly colored and ideal for any store who wants to advertise a special event. 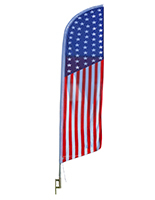 This patriotic swooper is synonymous with celebrations and is great for use in advertising sales or promotions. This display can be set up by one person due to the portability and light weight of the unit. 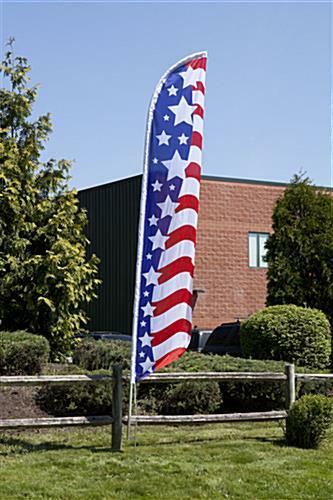 This patriotic swooper has a stay-open design that allows customers to read the banner with or without wind. The picture on this banner is dyed-through, single sided (mirror image on back side). This aluminum pole patriotic swooper, also known as a feather flag kit, is low priced! These banners are 142-1/2" tall by 27" wide for a stunningly tall presentation. This feather flag, patriotic swooper that is 14 feet tall, is the ideal outdoor marketing display! 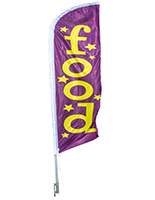 These advertising banners with flag pole are offered at wholesale prices! This patriotic swooper is designed with a curved pole so the feather shaped pennant will not curl up. This is ideal for outdoors when wind often affects the visibility of other advertisement methods. This patriotic swooper is colored with vivid red white and blue hues on the poly knit blend to ensure attention. Each feather flag includes an aluminum pole that breaks down into 4 pieces for easy setting up and taking down. 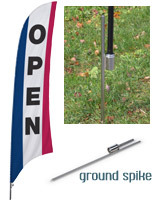 This patriotic swooper with the metal ground spike is perfect for installing into the grass or dirt and it can be reused if the user desires a different location for the flag! Please Note: String at bottom of flag is not for attachment purposes. Pole is designed to keep flag in place. Attaching with string may tear fabric. Flags are not for use in winds exceeding 40 mph.